It’s a hammer! It’s an axe! No, it’s a roofer’s hatchet! My first day at Chadds Ford Historical Society, I am elbows deep in a box of archaeological materials, digging for artifacts to display. If you caught that pun, I tip my shovel to you. I pull out what appears to be your basic axe head, the wooden handle unsurprisingly absent – wood does not preserve as well as metal. 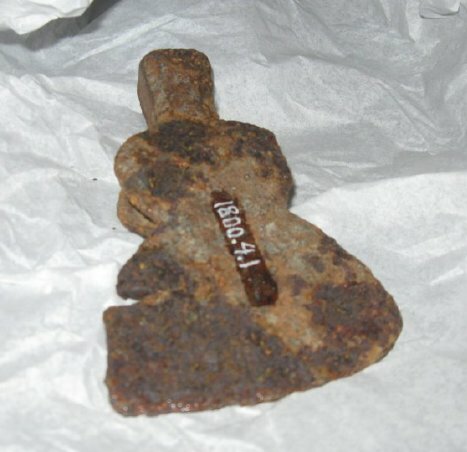 It’s a hefty chunk of iron that likely would not disintegrate as soon as you looked at it, unlike a number of the other metallic objects from the collection. The decision is made. The two hundred years-old axe head would meet the public the next day. As destiny would have it, among the crowds there is a gentleman who has had previous experience as a roofer. He looks upon our table of artifacts, one thing leads to another, and we discover the (not so) secret identity of this historic tool. Roof carpenters, both past and present, use this multi-functional instrument to fix and install roof shingles. The sharp edge splits and shapes the roofing material, likely white pine or other wooden variations. The blunt end that looks like a hammer: it’s a hammer. Surprise! This section drives in nails. And that notch on the bottom of the axe head? An accidental chip caused by overuse or aged corrosion, right? We rarely pull mint, intact items from the ground, so it’s not unexpected. Wonder of wonders, it’s part of the design of the hatchet. Intentional. Functional. How so? Here’s a hint: if there is a hammer to drive in nails…. The notch pulls out nails. Mind blowing. So there you have it. A veritable hybrid tool. Like a Swiss Army Knife. Or a keychain bottle-opener. What objects do you use that serve multiple functions? We are thrilled to have Victory Brewing Company as a participating sponsor in this year’s Chadds Ford Days on September 12-13. As a local home-grown brewery, Victory’s roots run deep in the Brandywine Valley. Having begun operations in 1996, Victory has expanded it’s reach into 34 states with its original craft beer that combines “European ingredients and technology with American integrity.” Its widely acclaimed brewery and restaurant serves its patrons locally with three brewpubs in Downingtown, Kennett Square and, coming soon, Parkesburg. We thank Victory for helping to set up an on-site tavern at Chadds Ford Days and can’t wait to enjoy its tasty brews. Categories: Chadds Ford Days, sponsor, spotlight | Tags: Chadds Ford Days, sponsor, spotlight | Permalink. We are happy to welcome Susquehanna Bank as a new sponsor for this year’s Chadds Ford Days this September 12-13. In addition to being our official banking institution, Susquehanna Bank has generously offered its sponsorship for this flagship event of the Chadds Ford Historical Society. Susquehanna is a regional financial services holding company with $18 billion in assets, including its commercial bank with over 240 locations in the Mid-Atlantic. Susquehanna’s Corporate Giving Program targets and contributes to innovative programs and projects in community and economic development, youth and education, and access to the arts, donating over $4 million in funding, volunteering and pro-bono work in 2013. We are honored to have their sponsorship and look forward to seeing them at the fair! We are proud to welcome Nemours Children’s Health System as a new sponsor for this year’s Chadds Ford Days on September 12-13. Founded by local philanthropist Alfred I. DuPont in 1940, the Nemours Children’s Health System is a non-profit healthcare system with a focus on family-centered care for children. Serving over 250,000 children in the Delaware Valley and Florida, Nemours has over 65 treatment centers and supports health prevention, intervention, education and research initiatives for all child-related care. We thank Nemours for its generous sponsorship and look forward to seeing them at the fair. We are very honored to have the Phyllis Recca Foundation as a major supporter and sponsor of Chadds Ford Days for several years. The Phyllis Recca Foundation is a non-profit organization that focuses on supporting and helping families with children suffering life-threatening medical conditions by raising the money to cover their treatment expenses. In addition to paying the medical costs of families in need, the Foundation also supports education, civic and social activities that nurture health and personal development for children. Phyllis Recca herself is a long-standing volunteer who has contributed an extensive amount of her own time and talent to the Historical Society. We thank Phyllis and the Phyllis Recca Foundation for its continued support as a featured sponsor for Chadds Ford Days. We are very honored to have Crozer Keystone Health System as a returning sponsor of Chadds Ford Days this September 12-13. Crozer Keystone is a 501c3 non-profit health system composed of five hospitals: Crozer-Chester Medical Center, Delaware County Memorial Hospital, Taylor Hospital, Springfield Hospital and Community Hospital. It also operates several outpatient centers, Healthplex Sports Club and a comprehensive physician network, as well as provides wellness, prevention, acute care, rehabilitation and restorative care to the community. We thank the Crozer Keystone for its continued generosity as a featured sponsor for Chadds Ford Days. We are thrilled to welcome PECO as a sponsor for this year’s Chadds Ford Days on September 12-13. Founded in 1881, PECO has been serving the greater Philadelphia’s energy needs for over 134 years. PECO reaches 1.6 million electric and 485,000 natural gas customers and is the largest combination utility in Pennsylvania. As a member of the community and corporate citizen, PECO supports programs in education, the environment, culture and the arts and neighborhood development. We are grateful for PECO’s sponsorship and look forward to seeing them at the fair.